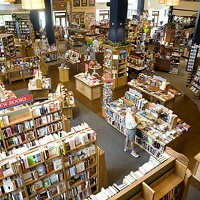 Open for just a little more than a year, the Charlotte location of this five-store chain has written a new chapter in retailing, hosting four book clubs, offering seemingly nonstop author events and kids story times ... even promoting local musicians during Junes Music & Movie Celebration. And  hello!  who wouldn't love Brontë, a novel bistro and wine bar. Sigh ... a bookstore with a wine bar. And catering. Now thats what we call feeding the soul.